CampDoc.com and CCC have partnered to offer a seamless integration for camp directors, camp administrators, camp nurses, and parents! The integration features SSO, or single sign-on. Families can simply log into CCC, and immediately after registering for an upcoming session or program, click on the CampDoc.com link to automatically be redirected to the CampDoc.com platform without having to enter a new password. No additional usernames, passwords or URLs are needed. With account provisioning, organizations no longer need to export participant rosters from CCC and upload them into CampDoc.com. If a participant does not exist in the CampDoc.com portal, CCC will automatically provision that user in CampDoc.com. Enable direct access from CCC to CampDoc.com so users no longer need to reenter login information. No need to manually export user data from CCC and upload into CampDoc.com, improving efficiency and saving camp directors and camp administrators time. Contact us for a Free Demo! Want to find out more about the CCC integration? Call 734.636.1000 so we can answer all of your questions, explain our systems in more detail and set you up with a demo! Christensen Computer Company (CCC) develops turnkey computer solutions for member-centric organizations, and today serves a nationwide marketplace of more than 700 companies. CCC offers a fully integrated suite of software solutions. Their custom software is designed to help improve communications with communities, streamline day-to-day operations, automate manual tasks, and better manage budgeting, fundraising, and program information. 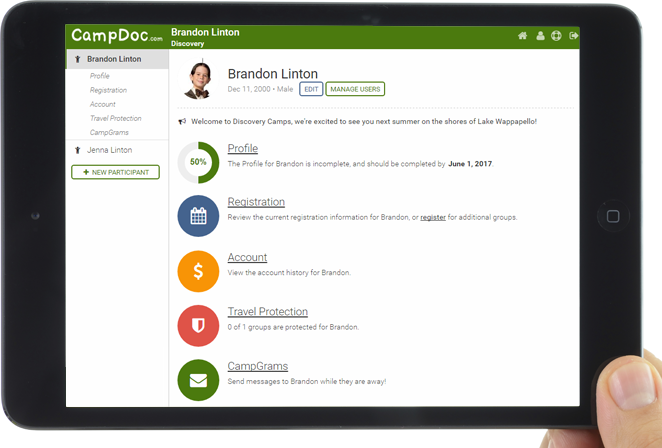 CampDoc.com is the leading electronic health record system for camps, offering free-online registration, travel and emergency medical protection, and CampGram one-way emails. Designed by camp doctors, nurses and directors, our secure, easy-to-use webbased solution manages health forms, allergies/medications and illness/injury tracking. @pissyrabbit You're welcome :) If there's anything else we can do to help, please let us know!